We’d love your help. Let us know what’s wrong with this preview of A Lady at Willowgrove Hall by Sarah E. Ladd. Cecily Faire carries the shame of her past wherever she treads, knowing one slip of the tongue could expose her disgrace. But soon after becoming a lady’s companion at Willowgrove Hall, Cecily finds herself face-to-face with a man well-acquainted with Her secret cloaks her in isolation and loneliness. His secret traps him in a life that is not his own. To ask other readers questions about A Lady at Willowgrove Hall, please sign up. Does anyone know the name for how this book is written as well as Julie Klassen? Where one chapter is usually of the female's perspective while the other chapter is of the male's perspective. Tandie Dual narrative, I think. “Willowgrove Hall is full of secrets, but soon everything hidden is brought to light. Spiritual Content- Cecily believes that God wouldn’t want anything to do with her; Talks about God, judging & God being The Judge; Bible reading & Scriptures are quoted; Church going; Faiths grow. *Other Spiritual Content: Cecily mentions that her father’s beliefs were rooted in folklore (if someone has twins, one is good & one is bad); There is a statue of a Greek god in the gardens. Negative Content- Minor cussing including: a ‘bloody’, a ‘stupid’, a ‘tosh’, a “what in blazes”, and a “how the devil”; Cecily’s father is described as greedy and drinks too much ale after her mother died; Bitterness. Sexual Content- two semi-detailed kisses; two semi-detailed embraces & lips get pressed to a forehead three times; An affair led to a child (the man was already married and the lady was his wife’s maid) (it’s an important part of the story but it’s not detailed); Mrs. Massey is a flirt; Love, falling in Love, trying not to fall in love, and the emotions. 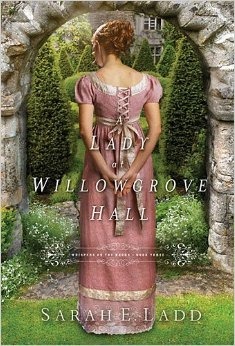 I really enjoyed “A Lady at Willowgrove Hall”, out of the three in this series I would say this was my favorite! I teared up at times and nodded in agreement at others. All three books in the “Whispers on the Moor” series are so well written to make you feel like you’re actually in that time period. Was this a helpful review? Say ‘Yes’ by clicking ‘Like’ on Goodreads! *I received this book for free from the Author for this review. "I think everyone has secrets, sir, and a right to their own thoughts. It is human nature, I think." .. . . .. . . "Some secrets are like a noose. The more you resist, the more they strangle you." Secrets. Cecily Faire and Nathaniel Stanton both have them; the question is, will exposure become a gateway to freedom or a dark, dank prison of regret? Beautiful Cecily Faire has been subject to cruel treatment from her father, banishment from her home and beloved sister, separation from her heart's yo "I think everyone has secrets, sir, and a right to their own thoughts. It is human nature, I think." .. . . .. . . "Some secrets are like a noose. The more you resist, the more they strangle you." Secrets. Cecily Faire and Nathaniel Stanton both have them; the question is, will exposure become a gateway to freedom or a dark, dank prison of regret? Beautiful Cecily Faire has been subject to cruel treatment from her father, banishment from her home and beloved sister, separation from her heart's young love, and now stands on the brink of a new life as a lady's companion after graduating from a reputable finishing school. Her arrival at Willowgrove Hall in the midst of a torrential storm places her directly in the path of Willowgrove's young steward, Nathaniel Stanton, when he stumbles upon Cecily valiantly struggling to walk to Willowgrove amidst the pouring rain. An overnight stay at the Stanton cottage forges a welcome friendship for Cecily between Mrs. Stanton and her three daughters. But when Cecily arrives at the grand Willowgrove estate on the following day, she is shocked to discover that her secret is still alive and well in the person of Mrs. Trent's(her new employer) nephew, Andrew Moreton. Nathaniel Stanton's legacy was dramatically altered the day his father died. Now as his aging employer's health steadily declines, he cannot help but wonder what will happen when others begin to suspect what he already knows to be true. Nathaniel has no plans to become a family man until his inheritance is revealed, but he cannot help but be drawn to the sweet spirit of Cecily Faire and determines to help her find her sister in any way that he can, knowing that Mrs. Trent's bitterness towards him might very well taint Cecily's impression of him in the process. I'm always excited to discover Regency romances in Christian fiction, as I've been a fan of this genre from the time I discovered Georgette Heyer, and I have to say that Sarah's knowledge and love for this era shines through in her writing. While I enjoyed the first book, The Heiress of Winterwood, the series got even better with each book. I'm not sure why this third book, A Lady at Willowgrove Hall, was my favorite, because the setting and characters have been strong throughout. Maybe this particular storyline was just especially appealing to me. The series features different characters, each book able to stand alone, yet there is a connection and it was great to see Cecily's background at Rosemere and Patience Sterling from book two. I was really drawn to Nathaniel, Willowgrove's steward - a man whose future was laid out from his birth. And the secondary character of Andrew Moreton added much interest/conflict to the story. He was a constant reminder of Cecily's past, and as the one who would inherit Willowgrove, he "cared more for the cut of his coat and the hue of his waistcoat than the legacy that had provided for families all around the county for generations." With the exception of a couple of backstory chapters, A Lady at Willowgrove Hall opens in Darbury, England, 1819 - yet these backstories cast a long shadow throughout the whole novel. Cecily's thought expressed in the first sentence - Is it always a sin to tell a lie? - establishes a pattern for secrecy that overshadows several of the characters. The elderly Mrs. Trent is at the heart of much of this, and I found her to be a very sympathetic character. The spiritual idea of forgiveness and moving forward is an overarching theme. It's so easy to think the past is buried, yet how quickly it can resurface years later - and that is something I suspect many of us can relate to. Cecily had long lived with the thought that if her own father rejected her, then surely her heavenly Father didn't love her - and I love the spiritual growth we see in her. "For years she wrestled with this idea . . . until it became easiest to simply hide from God. But now she was tired of hiding. Tired of secrets. Tired of allowing fear to dictate her thoughts." The narrative is more character driven than action packed, and that is something I really liked. I don't know what Sarah has planned, but I would love to see more of Nathaniel and Cecily in their new life, and also what happens at Willowgrove under Andrew's care. A Lady at Willowgrove Hall is a story that I believe historical fiction fans will enjoy and am glad to recommend it. Don't miss the previous two books in this series, The Heiress of Winterwood and The Headmistress of Rosemere. A Lady At Willowgrove Hall is the third and, I think, final book in Sarah E. Ladd's Whispers on the Moors series. I've really enjoyed these books! This book had an intriguing beginning and I thoroughly enjoyed seeing how the story progressed. I felt for both of the main characters, Nathaniel and Cecily, and Mrs. Trent. They all had to deal with painful things and I couldn't help but feel for them as they worked through them. The ending was sweet and a good conclusion to A Lady At Willowgrove Hall. In all, I enjoyed reading this book and recommend it if you enjoy regency romance stories. Let's start with the cover of this book, shall we? Isn't it beautiful? I would totally pick this up in the library if I saw it. I don't know who comes up with Sarah E. Ladd's covers, but they are all beautiful and well done. This is the third book of the Whispers on the Moor's series, but it doesn't need to be read with the other two to make sense of things. Actually having read the other two books (and in order, totally unusual for me :) This was probably my second favorite. Her first book The H Let's start with the cover of this book, shall we? Isn't it beautiful? I would totally pick this up in the library if I saw it. I don't know who comes up with Sarah E. Ladd's covers, but they are all beautiful and well done. This is the third book of the Whispers on the Moor's series, but it doesn't need to be read with the other two to make sense of things. Actually having read the other two books (and in order, totally unusual for me :) This was probably my second favorite. Her first book The Heiress of Winterwood was probably my favorite. Most of what happened in the novel is internal struggles for the two main characters. So there isn't a lot of action, and I did get slowed down by that a little bit. Not enough to stop reading it or even put it down and read something else for a while though. This book was sweet and very enjoyable. I have enjoyed Ladd's books from the very first one. I cannot wait to read more. I'm all a twitter over yet another captivating Regency novel by this author. Honestly, open book and fall through time. The temptation to curtsy when greeting my boss was nearly impossible to resist. And I had the strongest urge to ring for the maid to help me dress in the morning. Such a disappointment when she didn't make an appearance. Luckily Ladd's exceptional writing enabled me to live Regency through the eyes of Cecily. What an enthralling story. From the historical details to the compel I'm all a twitter over yet another captivating Regency novel by this author. Honestly, open book and fall through time. The temptation to curtsy when greeting my boss was nearly impossible to resist. And I had the strongest urge to ring for the maid to help me dress in the morning. Such a disappointment when she didn't make an appearance. Luckily Ladd's exceptional writing enabled me to live Regency through the eyes of Cecily. What an enthralling story. From the historical details to the compelling plot, I was totally hooked. Love the conflict and angst created by the layers of secrets and the surprising results when those secrets finally come to light. And the romance...be still my heart. Doomed by their secrets, Nathaniel and Cecily both feel they can't act upon their deepening attraction. Talk about keeping a reader on tenterhooks! A definite must read for historical lovers...especially Regency ones. Once again author Sarah Ladd has written an intriguing, regency era novel set amongst the dark moors -- with its hushed whispers and long buried secrets. Ms. Ladd has done an incredible job with her descriptive imagery of the mysterious beauty of the moors and of Willowgrove Hall, where our heroine, Cecily, is employed as a lady's companion. Cecily and Nathaniel, the steward of Willowgrove Hall, have secrets that have kept their lives in chains...and guilt that others have i Whispers and Secrets! Another book I've missed rating. Goodness, I'm getting bad at keeping up with my reading habits! I bought a copy of this as soon as I could. It's the best of the series, and made me eager to read more of her books (and Curiosity Keeper is definitely worth the wait! )...at some point, I intend to reread the entire series from front to end! Yeah, this book ended on a real bad note for me. Real bad. I'm giving it 2 stars because I enjoyed the first bit, but I think I'm done with Sarah E. Ladd's books. Overall, Ladd's romances are slow burns, but I've enjoyed them so far because they're more serious romances and less of the fluffy rom-com stuff. Don't get me wrong, fluffy is fine at times, but I prefer serious romance with realistic characters and conflicts. However, as the series has gone on there's been less and less that is pushing Yeah, this book ended on a real bad note for me. Real bad. I'm giving it 2 stars because I enjoyed the first bit, but I think I'm done with Sarah E. Ladd's books. Overall, Ladd's romances are slow burns, but I've enjoyed them so far because they're more serious romances and less of the fluffy rom-com stuff. Don't get me wrong, fluffy is fine at times, but I prefer serious romance with realistic characters and conflicts. However, as the series has gone on there's been less and less that is pushing the story forward. There's not much conflict -- and I'm not talking about needing to have massive over-the-top antics, but real reasons keeping the hero and heroine from getting their happily ever after. It took me a couple books to realize what it was that was keeping Ladd's books from being my favorites, and it's that her characters really don't have any growth. Romances are character-driven stories, and with that, you expect some sort of character arc with at least one of the main characters. However, Ladd's books don't really have that other than to a minor degree. With this one, the heroine and hero both have baggage, but it feels like the reader is simply told that they have baggage, and I never really feel their pain. And then the story really isn't about them learning to overcome it. They simply hold onto their issues through the whole book and then simply let it go when the time is right. I don't feel like there's any real change of heart. They have the issues to give them a reason why they don't immediately start courting, and then it's abandoned the moment it's time for them to get together, and not a lot of growth from one to the other. Now, I will say that I actually got seriously irritated -- nay, angry -- at the ending of this book because of how it handled it. The heroine is clinging to her deep, dark secret throughout the book. Then she finally hits a big emotional change moment and reveals it to her ailing employer. She even realizes how silly it was to have been so afraid of it being found out and acts as though she's freed of the burden now. However, when she sees the hero and he tries to pop the question, she freaks out and runs away because of her secret. What the crap? Honestly, it felt like the author threw that in to extend the ending of the book for a few more chapters. It's like the author felt that was the natural time to end the story and then realized she hadn't wrapped up all the plot lines, so she threw in another bit of drama so that she would have another couple chapters to tie all the loose ends up. And I won't go into all the stupid and weird things that happen in those chapters. There's bad decisions all over the place and a lot of "why didn't they do that sooner?" and "why was that necessary?" moments. Anyway, I don't think I'm going to read any more of hers. The stories lack the emotional depth to make them stand-out for me. This book is part of a series, but is a stand alone. I loved that the book dealt with flawed characters who are trying to do their best with the lives and the decisions that have been forced upon them. The book deals with forgiveness, not only of others, but of oneself. It is about letting go of the past and moving to the future. I really enjoyed the characters. They all have secrets, some become bitter and some become stronger because of the secrets. This is a really good Christian themed romance This book is part of a series, but is a stand alone. I really enjoyed the characters. They all have secrets, some become bitter and some become stronger because of the secrets. This is a really good Christian themed romance. Sarah Ladd has a passion for regency. Her research and attention to detail really shine through in her novels. I've kind of skipped around on her novels. I read her first book last month, now I've read her third....her second novel is waiting for me as we speak. I have to say, her debut came off beautifully and her third shines! I can't wait to go back and read her second novel. This was an interesting novel. As the reader, we got to find out the secrets of the characters, Nathanial and Cecily an Sarah Ladd has a passion for regency. Her research and attention to detail really shine through in her novels. I've kind of skipped around on her novels. I read her first book last month, now I've read her third....her second novel is waiting for me as we speak. I have to say, her debut came off beautifully and her third shines! I can't wait to go back and read her second novel. This was an interesting novel. As the reader, we got to find out the secrets of the characters, Nathanial and Cecily and then we got to watch as they did their best to keep their past to themselves as the story progressed. Then as they worked through their thoughts and decide if they could or should revel what they were hiding. I really enjoyed reading about Nathanial's family. His mom and sisters were fun and offered a bridge for Nathanial and Cecily to connect through. Mrs. Trent was another character I really liked. Despite her snappishness in parts...which she really was entitled to, in my opinion, she was a delightful lady for Cecily to interact with. Mrs. Trent, along with Cecily and Nathanial, had something she had to work through in her life, and after half a lifetime of battling it, I thought she handed it well. Mrs. Massey was a character I could not warm up to. Right form the get-go, her motives were obvious. If she wasn't so out their with her pushiness, I might have liked her, but as she put herself into the roll she did, without thought of stepping aside gracefully, she left a sour impression. The same went for Andrew Morton, but I won't go too much into that. I really enjoyed this story. With each story I've read by Sarah Ladd, they keep getting better and better. I can't wait to see more from her. What a beautiful conclusion to Sarah Ladd's Whispers on the Moors series. Regency romances are definitely Sarah's forte. She combines a rich and authentic setting with emotional tension that whisked me away into Cecily's life right away. Secrets are a theme of this novel, and who can't relate to having a secret tear a relationship or life apart (or at least witnessing such)? I think that's why Cecily earned my vote of confidence right away. I really wanted to see her overcome the circumstances wh What a beautiful conclusion to Sarah Ladd's Whispers on the Moors series. Regency romances are definitely Sarah's forte. She combines a rich and authentic setting with emotional tension that whisked me away into Cecily's life right away. Secrets are a theme of this novel, and who can't relate to having a secret tear a relationship or life apart (or at least witnessing such)? I think that's why Cecily earned my vote of confidence right away. I really wanted to see her overcome the circumstances which open this novel--and succeed. But I wasn't sure how that was going to happen. I didn't mind not knowing, though, because Sarah kept everything interesting as the story moved along and Cecily walked through change after change. The historical detail is superb; I can definitely see why people compare Sarah's writing to Jane Eyre and Jane Austen. This book reminded me of Julie Klassen, too. A few times, I would have liked more detail to what was going on. Some scenes felt rushed. And the death in the latter half of the book (no spoilers from me!) felt slightly contrived, but Sarah handled grief with grace. Nathaniel was intriguing from the beginning. I was surprised he made some of the choices that he did, but he firmly established himself as his own man and he had some tough choices to make that endeared him to me. A hero with a secret and secret strength? Yes, please. My favorite part of this book, though, were the interactions between Cecily and Nathaniel. It was clear early on that they are better together, that they are good for each other. It was just a matter of uncloaking every past secret and working through the dramatic tensions--and I won't say more lest I spoil a good ending! This is the second book of Sarah Ladd's that I have read and let me say I was not disappointed! The Regency period has to be one of my absolute favorites and this author does a fantastic job writing about that time period. Cecily Faire is disowned by her father for trying to sneak away in the night to marry the wealthy son and heir of her father's employer. She is left at Rosemeer (the school for girls from book 2 of this series) without any connection with her twin sister. 5 years later she is g This is the second book of Sarah Ladd's that I have read and let me say I was not disappointed! 5 years later she is given the chance to become a lady's companion for an older Lady who is at the end of her life. As she arrives at Willowgrove Hall she meets the steward of the estate who has a secret he is trying to hide. They continue to have interactions and his mother and sisters continue to make her feel part of their family. The Lady(Mrs. Trent) of the estate encourages Cecily to have nothing to do with Nathaniel Stanton (the steward) and his family. Cecily also discovers that the nephew, Andrew Moreton, of Mrs. Trent was her long ago fiance(sort of) whom she tried to elope with. With everyone carrying around secrets and guilt or pain from the past can they learn how to move forward and allow forgiveness to help heal them and allow a happy future for all? This was a great clean read. You do find out Cecily had a premarital relationship with Andrew thinking they were to wed soon but there is only a brief mention of it and no details. Hope you enjoy it as much as I did. Thanks Sarah Ladd for a great entertaining read that I didn't want to put down and couldn't wait to finish!!! I have not read either of the previous novels in Sarah E. Ladd’s Whispers on the Moors series, but in no way did that hinder my enjoyment of reading A Lady at Willowgrove Hall. (In fact, now I can’t wait to pick up The Heiress of Winterwood and The Headmistress of Rosemere.) I love a good Regency-era novel and this new one by Ladd is certainly a fantastic one. Within well-detailed scenery and situations, both Cecily Faire and Nathaniel Stanton come to l This review is also posted on Book by Book. I have not read either of the previous novels in Sarah E. Ladd’s Whispers on the Moors series, but in no way did that hinder my enjoyment of reading A Lady at Willowgrove Hall. (In fact, now I can’t wait to pick up The Heiress of Winterwood and The Headmistress of Rosemere.) I love a good Regency-era novel and this new one by Ladd is certainly a fantastic one. Within well-detailed scenery and situations, both Cecily Faire and Nathaniel Stanton come to life with genuineness and realism as each deals with the secrets of the past in order to face and embrace the future. The story is sweet, charming and heartwarming, so naturally, I thoroughly enjoyed it. I recommend it for fans of Regency-era novels. This is probably my favorite of all of SL's novels I have read. While I have enjoyed her others lightly, I felt like this novel, the characters showed more depth and the novel was better put together. It flowed better for me as a reader. I loved the story, their careful noticing of each other, not hoping that perhaps they other might return the growing affection. The characters of each of the main characters, forgiving, reflective, diligent, and hardworking drew me into the story. Kindnesses, trying to resolve differences, along with living every day life made for a good read for me. Exceptional conclusion to the Whispers on the Moors series of historical suspense by this talented author. From the intensity of the opening scene of Cecily Faire's anticipated midnight ride to Scotland and forthcoming marriage, to the desperate search for her missing sister, I have been entranced with this story. Romance and well guarded secrets provide a heady combination in plot development. Depth of character personalization, intrigue, and historical details all captured both interest and emotions. A Lady at Willowgrove Hall has been a pleasure to read and I add my full recommendation to readers of historical suspense and romance. Now audio listening May 13.16 Carmel O'Donovan capably narrating. I think out of the series, this book might be my favorite. I'm not sure why or if it really is any "better" than the previous books; I might have just been in the right frame of mind to read this one. I did like the characters, especially Cecily, and I think she is probably my favorite heroine in this series. Also, I'm not a really big "mushy romance" kind of person, so I liked that while there was definitely interest between the two characters, it never got too out of hand and was very restrain I think out of the series, this book might be my favorite. I'm not sure why or if it really is any "better" than the previous books; I might have just been in the right frame of mind to read this one. I did like the characters, especially Cecily, and I think she is probably my favorite heroine in this series. Also, I'm not a really big "mushy romance" kind of person, so I liked that while there was definitely interest between the two characters, it never got too out of hand and was very restrained. This novel also had a lovely message of forgiveness. Secrets. Intrigue. A dashing hero and a heroine you root for. All these add up for one fantastic Regency read in book 3 of the Whispers on the Moors series. Don't worry if you haven't read the first two books. This story does just fine as a stand-alone as well. Cecily Faire starts out as a head-strong young girl about to run away with her beau. Bad idea, especially since her father catches them. The story ten fast-forwards to Cecily all grown up and much more tame. She's sent to become a lady's c Secrets. Intrigue. A dashing hero and a heroine you root for. All these add up for one fantastic Regency read in book 3 of the Whispers on the Moors series. Don't worry if you haven't read the first two books. This story does just fine as a stand-alone as well. Cecily Faire starts out as a head-strong young girl about to run away with her beau. Bad idea, especially since her father catches them. The story ten fast-forwards to Cecily all grown up and much more tame. She's sent to become a lady's companion, and of course, that's where she runs into her former beau. There are several twists and turns that keep you guessing until the very end. A Lady at Willowgrove Hall is about a girl named Cecily Faire who tried to run away one night when she is 16, but gets caught by her father. Her father then takes her to Rosemere, a school for girls, and separates her from her twin sister, Leah. Five years later Cecily is working as a teacher at Rosemere and has been trying to find her sister, but she has no idea where she is because after her father left her at the school he moved away and took Leah with him. One day the Headmistress at Rosemer A Lady at Willowgrove Hall is about a girl named Cecily Faire who tried to run away one night when she is 16, but gets caught by her father. Her father then takes her to Rosemere, a school for girls, and separates her from her twin sister, Leah. Five years later Cecily is working as a teacher at Rosemere and has been trying to find her sister, but she has no idea where she is because after her father left her at the school he moved away and took Leah with him. One day the Headmistress at Rosemere, Patience Sterling, tells Cecily that she has found a job for her working as a lady's companion at Willowgrove Hall for a lady named Mrs. Trent. A Lady at Willowgrove Hall is also about a guy named Nathaniel Stanton who works at Willowgrove Hall as a steward. Even though he is the steward at Willowgrove Mrs. Trent hates him because he is the illegitimate son of Mr. Trent who had died and when Mrs. Trent dies Nathaniel will inherit a place called Lockbourne. I thought this book was good and had an entertaining plot. I liked how Celicy was trying to find her twin sister during the book and was able to find out things about her dad and sister and what had happened while she had been gone. I didn't like how there weren't any action parts in the book though. I kept waiting for something to happen, like Celily or Nathaniel to be attacked or have some other big problem like being fired, but it never did. I also felt like the parts when there was a plot twist were cut a little short and the main characters were able to come up with a solution easily. I would recommend this book to any one who likes books that take place in the past from about 1400-1800 AD and takes place in places in Europe. This book takes place in the 1800s, from 1814-1819 in England. I read this book because I like books that take place in this time period and it was recommended to me by someone who also likes books that take place around this time. One of my favorite quotes from this book is when Cecily says in chapter 23, "I took the liberty of embellishing the bodice slightly," when she is talking to Mrs. Massey, a dressmaker who is about Cecily's age and had made some dresses for her. I like this because during the book the author infers that Mrs. Massey is jealous of Cecily and purposely messed up all of the dresses she made for her. Then when Cecily said she changed the dress Mrs. Massey is annoyed and I thought that was funny how Cecily was able to figure out that all of the dresses were messed up and fix it and how Mrs. Massey responded. This quote isn't very significant to the theme of the story, but does help to move the story along. In this quote the author is telling you a little more about Mrs. Massey's character and helps us to infer the Mrs. Massey is very jealous of Cecily and doesn't like her a lot. 3.75 stars. I enjoyed this book a lot better than the other 2 in the series, mostly because it didn't have some ridiculous adventure plot at the end. Sarah Ladd gets better with every book! I loved this story and the characters! As of July 26, 2018, I have listened to 62% of this audiobook. It seems a bit slow-paced but there is enough mystery to keep me listening. July 27, 2018. I have finished listening to the story. The narrator was hard to understand at times because of her accent and poor delivery. She didn't have much expression and I got tired of her voice. Holy moly! This series just keeps getting better! I literally sat up until 4:30 a.m. just to see how this concluded and then I walked around like a zombie all day—it was well worth it! This author has a way with words that just pulls me into the story. I just can’t get enough of these characters! There’s a bit of edge to these stories but of course, so tastefully done that no one could complain. In full disclosure, there’s mention of an affair that resulted in a child as well as a one of the ladies lamenting that she had given herself to someone before marriage. It is not explicit and thus, it is of my opinion that this is safe for teens. As a lot of parents follow my blogs to find appropriate literature for their teens—I felt the need to have a full disclosure there. All in all, I love this book. I love this genre and I absolutely love this author’s writing. I really hope there is another installment in this series. Cecily Faire has just arrived to serve as the lady’s maid to the mistress of Willowgrove Hall. It is there that she comes face to face to with the man who changed her life forever—and not in a good way. Cecily was disowned by her father and she lost contact with her beloved twin sister at the age of sixteen—all due to a messy love affair with the prestigious Andrew Moreton. Cecily had been sent to a school for girls, Rosemere and when it became time for her to leave, the mistress of Rosemere had set it up for her to become a lady’s maid to Mrs. Trent. Unbeknownst to Cecily at the time that Mrs. Trent is the grandmother to the dreadful Andrew Moreton. When she arrives, not only is she appalled that Andrew is present at Willowgrove but she is fearful that the handsome steward of the Hall may never return her affections if he ever knew her dreadful secret. Mr. Nathanial Stanton has his own secrets, however and the stuffy Mrs. Trent is determined to turn Cecily and everyone else that she can against him. When Mrs. Trent passes, Cecily sets out to find her long-lost sister and Nathanial is determined to help her and also to win her heart. They are a cloak, a barrier insulating you from judgment. They are a jail sentence. They are a slave master. They are a burden you must bear either to protect yourself or others. This is the life Cecily and Nathaniel have both endured for years. Never able to consider a future with anyone for fear of exposure. For Cecily, her secret must be kept for self preservation, to protect her heart and reputation. Unveiling it could threaten present or future employment. For Nathaniel, his secret needs to be kept for the sake of his family. He cannot risk it coming to light for the shame it would bring upon his mother and sisters. (view spoiler)[At 16 Cecily left the twin sister she loved, and father she feared, late one night to run away with Andrew, the landowner's son. Caught! Her father was aware she would do something foolish, and apprehended her before she had a chance to get away from the meeting point. Without returning home for her things or to say goodbye to her sister, her father drove her hours away to Rosemere , a private girl's school, and left her there forever. She never again had contact with her father nor sister. They had moved away. Now she bore the shame that she had given her heart, soul and body to a young man she was never able to marry. At 21, and after having been a teacher at Rosemere for some time, the headmaster was able to secure her a position as a lady's companion for Mrs. Trent, an elderly, ailing widow, and owner of Willowgrove Hall, the village, and surrounding lands. The shame of not being a true lady made it difficult to think of herself in this position, but the confidence the headmaster had in her abilities to conduct herself as a lady bolstered her. She had a new life, and would do all she could to do her best. Nathaniel , the steward of the Willowgrove, was left this position after his father died… um… both his fathers. The father he had always known was not his biological father. Mr Trent was. A brief love affair with Mrs. Trent's lady's maid left her pregnant. To cover the shame, she was to marry the steward of Willowgrove, and the scandal was to be kept secret. Nathaniel, however, was to inherit the steward position at his father's death, plus another smaller estate some distance away that Mr. Trent owned, as Nathaniel was his only surviving child. The meeting of Nathaniel and Cecily happened during a horrible storm that had washed out the bridge to Willowgrove, on the way to her new position. The carriage driver dropped her off some distance from the Hall, and she was to find her own way there in the rain. Nathaniel was out with his dog, Gus, to assess the storm damage. Gus suddenly took off like a shot. The next thing he heard was screaming. Cecily was afraid she was being attacked by some beast. Upon finding her, Nathaniel calmed her down, and took her to his mother's cottage. There she met the loveliest family, was warm and dry, spent the night, and became immediate friends, and an unfortunate attraction to Nathaniel. The next day she was shown the way to Willowgrove Hall where she eventually met Mrs. Trent. What she didn't know, was that the nephew who was to inherit the land upon Mrs. Trent's death was none other than Andrew, the young man she was to run away and marry with years ago. Of course, there are emotions all around. Andrew is engaged to another, devastated that he was unable to find Cecily all these years, and now he is on the same grounds with her. Cecily now has a respectable position, and will not jeopardize that. Her heart is broken, however, knowing the young man the yearned for all these years is right there, unavailable. But her intent is to be honorable, never reveal her feelings in order to protect everyone, including Andrew's intended, and be deserving of the position she was given. But oh, how hard that was. 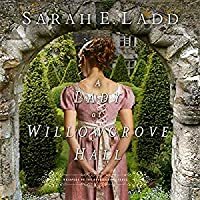 A Lady at Willowgrove Hall is the third book in Sarah E. Ladd’s Whispers on the Moors series, coming after The Heiress of Winterwood and The Headmistress of Rosemere. Although I haven’t yet gotten the chance to read The Heiress of Winterwood, I read The Headmistress of Rosemere a little less than a year ago, and absolutely loved it. That novel made me a huge fan of Sarah’s, and this book just reinforced that decision. 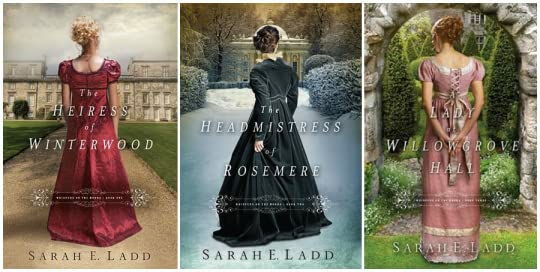 Honestly, I may have liked this book a little bit better than the second one, A Lady at Willowgrove Hall is the third book in Sarah E. Ladd’s Whispers on the Moors series, coming after The Heiress of Winterwood and The Headmistress of Rosemere. Although I haven’t yet gotten the chance to read The Heiress of Winterwood, I read The Headmistress of Rosemere a little less than a year ago, and absolutely loved it. That novel made me a huge fan of Sarah’s, and this book just reinforced that decision. Honestly, I may have liked this book a little bit better than the second one, but I’m not entirely sure. Each is wonderful for mostly different reasons, so I cannot be sure which is my favorite. No matter, for both have made it onto my all-time favorites list, and that is a real accomplishment, to be sure. Cecily Faire has been harboring a secret for well on five years without telling a soul, and it has made it difficult for her to make real connections with people, which has kept her from finding a “family” to stand in for the one she lost so long ago. When she is given the opportunity to become a lady’s companion for the mistress of Willowgrove Hall—Mrs. Trent—she hopes that this can be a new start for her, though at the same time she dreads accidentally confessing something that could give away her greatest secret. Will she be able to open her heart to those around her, or will she choose to leave when surprising secrets come to light? Nathaniel Stanton—the steward of Willowgrove Hall—has also been harboring a secret of his own, one that turned his world upside down and caused him to live a life that is not his own. He has decided that marriage is not for him, at least not until he is finally able to reveal his secret, but when Cecily arrives at Willowgrove Hall, she changes everything. He is drawn to her in ways he never imagined he could be, but he knows she holds secrets, and he fears taking a chance on love. Will he put aside his plans of not getting married, or will he let Cecily, and the secrets she carries, into his heart? A Lady at Willowgrove Hall is a novel full of secrets, love, and forgiveness that will sweep you off your feet and touch your heart in ways you never imagined. And the best part about this book—aside from the wonderful romance that is—is the way that it weaves in Christian themes without preaching at you, though I would most likely be okay with it if it did. Anyway, I’ve already mentioned that I added this to my all-time favorites list, so it is pretty clear that I have chosen to award it all five bookshelves. It well deserves it, since it is a wonderful novel I would recommend to absolutely anyone.